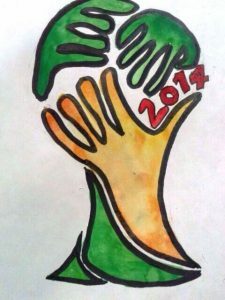 It has been a little over two weeks since the football fiesta that was the 2014 FIFA World Cup came to an end. What an end that was with Shakira dancing, Carlos Santana playing the guitar and Mario Gotze sneaking in a goal at the 113th minute! The Germans partied hard, apparently so hard that well they actually damaged a bit of the World Cup Trophy. The German joy of winning the coveted trophy after 24 years was pretty evident when the Head of the German Football Association, Wolfgang Niersbach, defended their national side by saying that this was not the first time that a World Cup Trophy was damaged in the course of the celebrations that followed the win. He even assured the press that they have specialists who can fix the Golden Trophy which is estimated to cost around eight million pounds. Germany ended up becoming the first European team to win the World Cup in the Americas. In other news, Mr. James Rodriguez has reportedly agreed to Real Madrid’s offer of around 60 million pounds, didn’t I tell you he’s someone to watch out for? Here’s wishing him all the luck in Spain. There have been several high profile signings by most clubs in the wake of new stars being discovered in this edition of the tournament. Life seems to be going well for most of the players involved in the tournament. I would like to take a moment or maybe the rest of this post to mourn the state of fans all over the World who are currently experiencing withdrawal symptoms after watching an entire month of football. You eventually experience a certain existential crisis just like after you finished watching all seasons and all episodes of your favourite sitcom. No kidding! On a typical day during the World Cup I used to come back home from work at 9 pm and plant myself in front of the TV for the 9:30 pm match. Well, that’s not going to happen again anytime soon, is it? Nope. The English Premier League is beginning soon, but it’s definitely not the same. I miss the excitement, I miss the action, I miss the Brazilian team singing their national anthem, hell, I even miss Café Rio, that annoying Pitbull song and even all the irritating football related advertisements. It is pathetic, but it’s a real phenomena, this World Cup hangover. It seems people all over the world have found ways to deal with this strange disorder, there’s a flipbook by Stabilo which documents Van Persie’s flying goal against Spain, Cahill’s amazing volley against the Dutch, and also my favorite goal of this tournament, Rodriguez’s spectacular goal against Uruguay. Most others like me just resort to reading all kinds of articles about every single aspect of the beautiful game. This World Cup was fun and it was a Carnival that lasted a month and promised a lot and delivered on most of its promises. Here’s a hoping that the next one will be just as good, if nothing, it will have lots and lots of Vodka. See you soon, Russia. Do Svidaniya! 5th FIBA Asia Cup: Philippines survive a brave Indian comeback to win 70-66Withdrawal Symptoms?